You are here: Home / exercise / Move Beyond Plain Ol’ Planks with 6 SUPER Planks! Move Beyond Plain Ol’ Planks with 6 SUPER Planks! Now that we’ve covered both the five biggest reasons you should make planks part of your regular workout and the four fundamental plank positions to start out with, you’ve hopefully made progress on tightening and toning your core and increasing your overall strength and stability with planks. In fact, you may have hit the point where regular planks have gotten a bit too easy, which means it’s the perfect time to advance your plank progressions. 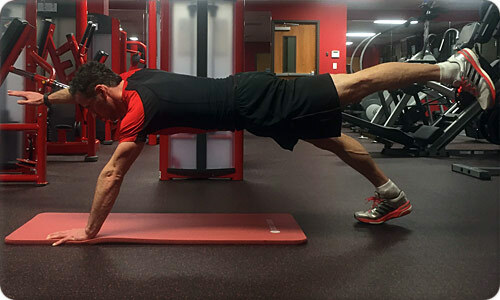 Today we’ll look at six advanced forms of the plank you can add to your workouts to really blast your abs and core while putting your balance and stability to the ultimate test. If you’re looking to progress beyond standard planks, a great way to start is with raising one arm or one leg during your plank while maintaining your balance and keeping a straight line from your head to your heels. Ensure your core remains engaged — you’ll need it as you’ll be working to maintain your stability with three points of contact now instead of four. The next progression is to raise the opposite limb at the same time so that now you only have two points of contact. Try to hold the plank with opposite limb extension position for 30 seconds before resting and then switching to the opposite arm and leg combination. The plank walkup, or plank walkup to pushup, requires you to maintain the straight line from your head to heels as with other forms of the plank, but in this case you’ll be transitioning from a forearm plank to the straight-arm plank (or high plank) and then back. Take each transition slow, as the key is to keep your core engaged and your proper plank form while moving from a position with both forearms on the ground, to one forearm on the ground and the other arm in the high plank (push-up) position. Next, extend both arms into the push-up position and then pause before first moving the opposite arm back to the forearm-on-the-ground position and then both arms back into the full forearm plank position. On your next plank walkup, start with the opposite arm this time, so that each “rep” of the plank walkup you’re leading with a different arm. Try to keep a steady pace for 30 seconds to 60 seconds when doing plank walkups to pushups. If you want to add a progression, you can also perform a full pushup each time you reach the pushup position in the plank walkup. An even more advanced plank walkup progression involves reaching under your body and moving a weighted object like a sandbag, dumbbell or kettlebell to the opposite side each rep of the plank walkup. In all forms of the plank walkup, you’ll want to focus on minimizing any rocking or rolling of your body — ensure you keep your core as stable as possible the entire time you’re in the plank. 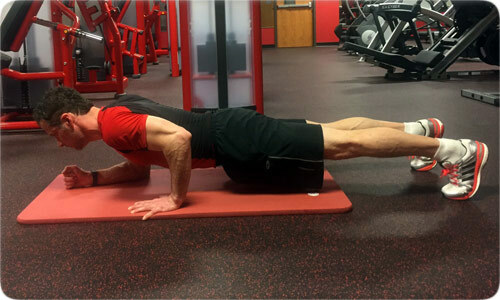 If you want to really crush your core even more than in regular planks, plank jacks are an excellent option. The key here is to keep your core fully engaged, your pelvis steady and your back straight while adding a jump to the standard plank. In other words, you’ll be jumping your feet from the normal hip-width apart position to a much wider stance as seen in the video below. Try to maintain a steady pace and a stable position while performing plank jacks for 30 to 60 seconds. If you’re looking for a way to really blast your triceps while strengthening your core at the same time, the Uneven Plank is hard to top. To get into the uneven plank, you’ll start in the forearm plank position. Keep one forearm on the ground while moving the opposite arm into the downward part of the push-up. Keys in the uneven plank are to make sure your elbow of the arm in the push-up position stays as close to your body as possible, and also ensure this arm remains in a line parallel to your body. The Uneven Plank will simultaneously hammer your core and triceps, with your core having to work even harder than in standard planks to maintain your stability. As a result, you’ll likely find it more difficult to maintain the Uneven Plank for an extended time. If your form begins to falter, take a break before repeating on your other side by switching arm positions. Adding a stability ball or Bosu ball increases the level of difficulty when performing planks, forcing your core muscles to stay completely engaged in order to maintain your balance. You can perform forearm planks or straight-arm planks on stability balls, and if you need a modification when starting, you can perform the ball planks on bent knees initially. 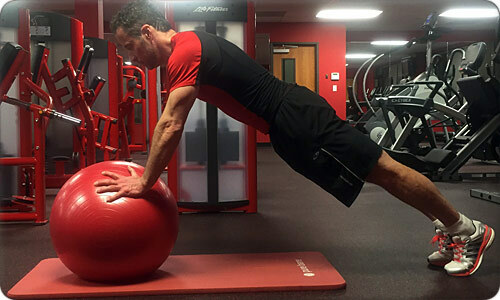 Expect to be able to hold your plank for less time when performing them on a stability ball, as the continual struggle against instability exerts considerable tension on all of your stabilization muscles. In other words, stability ball planks offer a great way to get maximum results in minimum time. Speaking of maximum results in minimum time, the king of advanced plank exercises may well be the RKC Plank. Short for Russian Kettlebell Challenge Plank, the RKC plank is truly a total body workout, as you’ll be generating as much tension as possible throughout your entire body while holding the position. And while the RKC plank looks very similar to a standard forearm plank, it exerts much greater tension on your core and most other parts of your body. The increased tension will crush your core in a matter of seconds rather than minutes. Don’t be surprised to feel your entire body shaking after just ten to twenty seconds of trying to hold the RKC plank. In fact, the RKC plank has been shown to hit the internal obliques twice as hard, the abs three times as hard, and the external obliques four times as hard compared to standard planks. Really focus on maintaining constant tension in all parts of your body when performing the RKC Plank. And rather than attempting to perform the RKC plank for an extended period of time, start with 3 to 5 sets of holding the position from 10 to 30 seconds, based on your ability to maintain the proper form. What’s your favorite advanced plank? Let us know in our comments section and share any tips and tricks you have for getting the most out of your plank workouts. A Perfect Form of Exercise? Top Trending Recipe: Bone Broth Soup!